SEO is complex. At a time, you think you have completed but there is more you haven’t even explored. Plus, there are constant updates from Google making some of the techniques which worked earlier now an outdated one. However, many elements are constant. You can focus on them for a long term. A meta description is one of them. 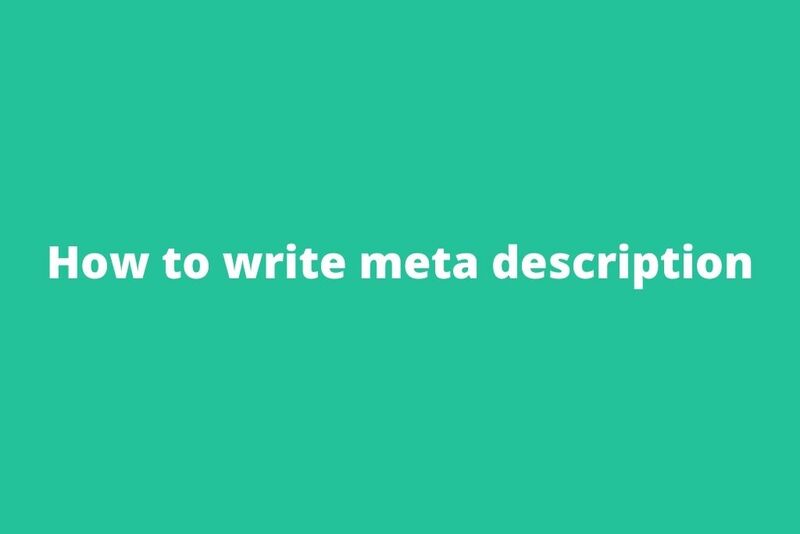 A meta description is an HTML attribute that provides a concise summary of the webpage. Meta description can be a single sentence or a paragraph. They appear below your page’s URL in a SERP (search engine results pages). Sometimes google can pull meta description text from other areas of your page to answer the query. Meta descriptions are shareable. It means when people share your articles the description is shared too. You need to make sure that it is strong enough to boost your CTR. How important is a meta description? Are they google ranking factors? This is the crucial part you need to understand. Google search engine doesn’t use meta description in their ranking algorithm, but it doesn’t mean it isn’t essential. It indirectly affects the google ranking factor. The meta description is your space for elevator pitch with the objective to increase CTR. The primary purpose here is to increase the CTR (click-through-rate). A good CTR means Google understands that your page is relevant to the search. When creating a meta description, you need to think like a visitor on your page. It should give a peek to what the reader can expect and generate interest. Google cuts off meta description after a certain width. It doesn’t measure the meta description by characters but measure by pixels. The safest is 155 characters for this pixels. Try out giving your crucial information in the first 155 characters. The search engines will chop off any extra characters, and the info looks unclear. The example above shows an incomplete meta description due to more characters. The information is incomplete. This is the best example of a meta description with good length. The meta description gives a complete information with the character limit. This site is more trust worthy. Your meta description is the invitation to the page. You should use avoid sounding like a dictionary and use layman terms which is easier for everyone to comprehend. Write it as if it was for a kindergarten kid. The word “browse” provokes the user. With this command, the visitor is going to click your site for further info. It can overlap with using action-oriented language. Making it clear, on your sales text invitation like Learn more, Get it now, Try for free comes in handy. The “See more” Call-to-action is more appealing. These ideas are surely going to help you to increase the CTR. Ensure your visitor what they can get by clicking on your link. Write a short sentence letting searchers know what they can expect from your post and why its worth their time. Use your chance to sell them on what you have to offer- informative and valuable content. The meta description itself gives the specific solution. These types of meta description are trust worthy. As a visitor I will directly click the web page for further knowledge. Make sure your keyword for the web page shows up in the meta description. Search engines even highlight the searches query in your snippet. This will make the link even more appealing. “Annapurna Base Camp” is the focus keyword of the article. The focus keyword is used in the meta description and is highlighted in by SERP. This link looks more appealing. If you have a product, focusing on technical specs of the product is a good idea. For example: If your meta description contains the information like manufacturer, SKU, price, discounts your visitor is highly likely to click. The meta description clearly specifies the product. A clear specification about the product than other random information is more appealing. Your meta description should match with the information you provide. Misleading descriptions increases bounce rate. You will lose ranking even before you would realize. Although the page title is different, all the page will appear to be the same due to the same meta description. It is better to leave the description blank instead using duplicate meta description. Google will pick a snippet from your page containing the keyword for blank meta description.